This three-colour breakfast is actually a low-carb, high energy breakfast. I made it recently for a friend, her seven year old, and myself. My friend told me she's concerned about her daughters weight. It is almost-natural to overfeed your kids; you want them to be well-fed, happy, and full. Unfortunately the phrase 'killing with kindness', comes to mind. Your want for your children to be full is great, but it's not always so good if you're indulging them with junk food, or simply, too much food. Instead of piling your child's plate high with white carbohydrates like white bread, and cereal at breakfast, put in a bit of effort and let them enjoy a fancier (but healthier) breakfast. 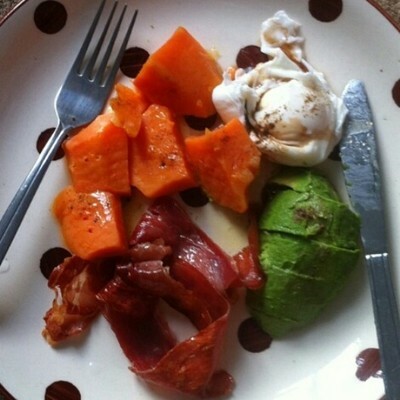 Sweet potato is a fantastic alternative to white bread and white potatoes, especially at breakfast time because it is rich in folic acid, fibre, and vitmain k. I'm sure I don't need to boast about the benefits of nutrient-rich and easy to digest avocado, the high protein in eggs, or the more luxurious and lower in fat proscuitto, which replaces the rather-fatty bacon. I advise serving this at the weekend, it's then seen as a 'treat', which they're allowed when they're not at school, and they won't even notice how healthy it is. Prick the sweet potato with a fork and place it in the oven for 20 minutes at 180 degrees, gas mark 4. Set a saucepan of water boiling, and add a splash of the vinegar. 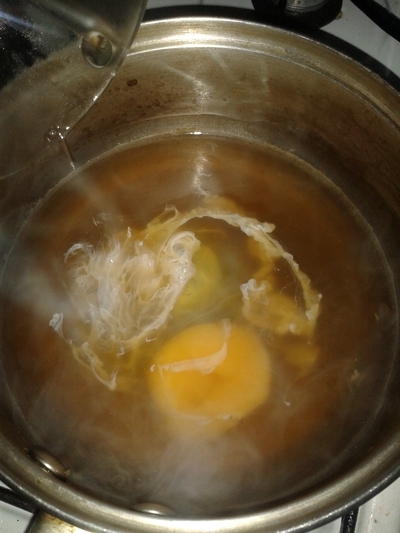 Stir the boiling water fast and quickly crack the eggs in, one after the other. 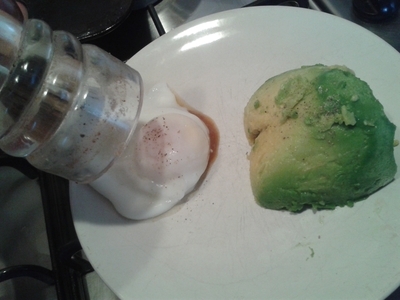 Turn the heat to a simmer for 3 minutes for a medium poached egg. 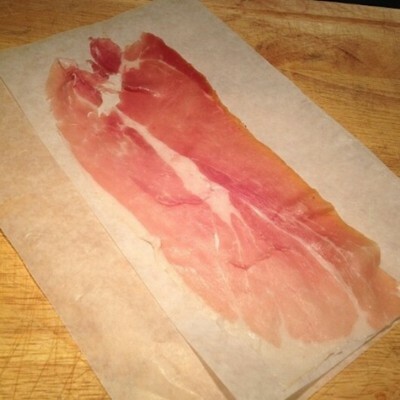 Fry the prosciutto in the coconut oil for 1 minute. 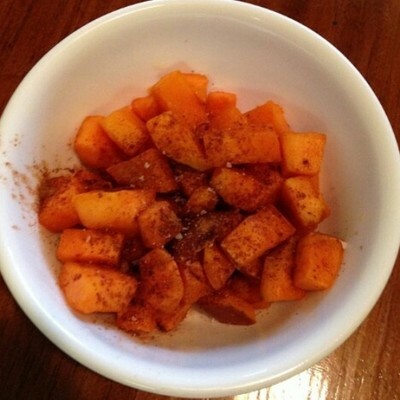 Remove the sweet potato from the oven and slice into chunks. Season with the pepper and the chilli powder if you like and set aside in a bowl. 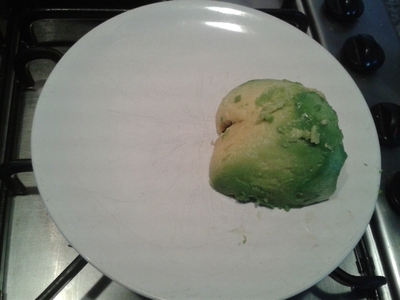 Scoop the avocado out of the skin and slice half of it finely. 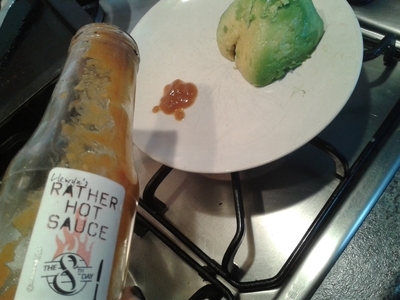 Add a dollop of the hot sauce, which keep the egg in place. Season with black pepper and top the sauce with the egg. Add the remaining ingredients and enjoy. Colourful, healthy food is delicious and enjoyable. My friend's daughter was full, and didn't ask for seconds (which apparently she's been doing lately).